Buying her first home at the age of 28 is what ignited Lea Smith’s interest in real estate but her love and passion for her city, her community and helping other’s is her driving force. I love my city and I want to be able to invest into it by bringing people back here and help to restore its natural beauty, flare and charm! says Lea. Originally from Los Angeles, she moved to Detroit with her family when she was just 5 years old and was raised and still resides in the city’s Eastside. 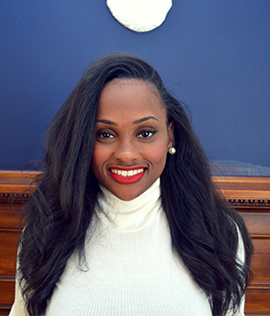 Prior to getting into the real estate business, Lea ran her own after school programs for Detroit Public Schools and currently serves as the President for her 501c3 non-profit, Breaking Cycles. She obtained a Bachelors of Arts degree in Management from Columbia College Chicago. Her hobbies include cooking & eating (lol), exercising, spending time with family and friends and traveling. Some of the places she’s visited include: Tokyo, Dubai, Milan, Rome, Cannes & London. Her approach to business is built on: Dedication, Communication, Determination, & Trust while embodying the ability to cater and adapt to all of her client’s Real Estate needs. Lea not only understands the importance of such a large purchase as real estate but, also the significance of going from a renter to an owner. She understands and takes pride in homeownership and she’s knows its rewarding feeling. She hopes to share this feeling and experience with others.